I was in London a couple of weeks ago and while browsing shops in Camden Market I came across a used clothing store that had a bunch of foreign (to the UK) sports jerseys. 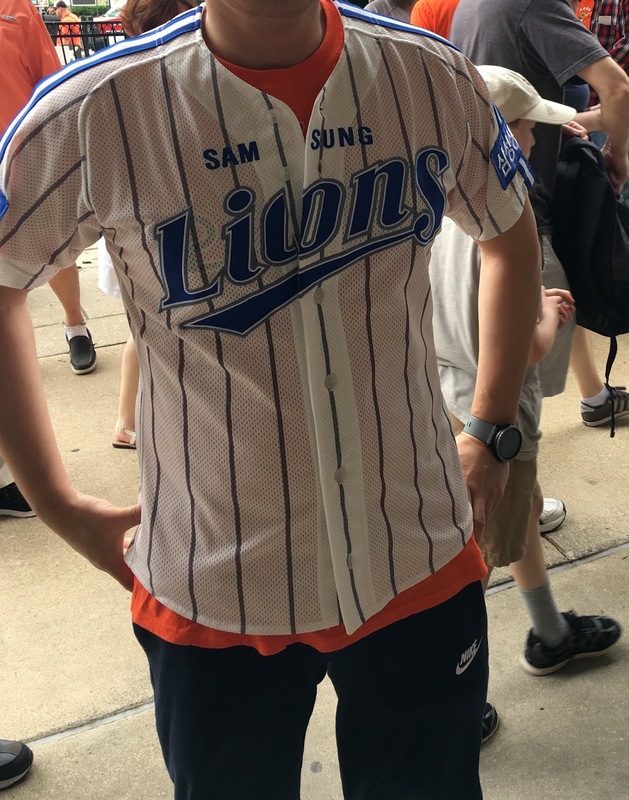 The majority of them were for the NFL and MLB but I did see what I think was an industrial league jersey from Japan as well as a Yomiuri Giants jersey that I'm pretty sure was for Kenji Yano. I didn't buy it since it probably wouldn't have fit and it's for a team I don't like that much but it was certainly an odd thing to come across in England. Yano is one of a number of players who has announced he's retiring at the end of the season so I'll be doing a post for him in the next few weeks. - BBM announced that their annual Rookie Edition Premium set will be released in late October. This box set will contain 38 cards - a 36 card base set plus two premium cards which may be parallel, autograph or memorabilia cards. The 36 cards (three per team) feature top rookies from the season but they aren't necessarily each team's top three picks from last year's draft. - Two years ago BBM issued a multi-sport set called Masterpiece to celebrate the 70th Anniversary of BBM Sha, the parent magazine publisher for BBM. Last year they did another multi-sport set called Infinity. This year they will release yet another multi-spot set and it too will be called Infinity. It's a pack based set but there's not a lot of detail about the set on the web page - I can't tell you how big the base set is. 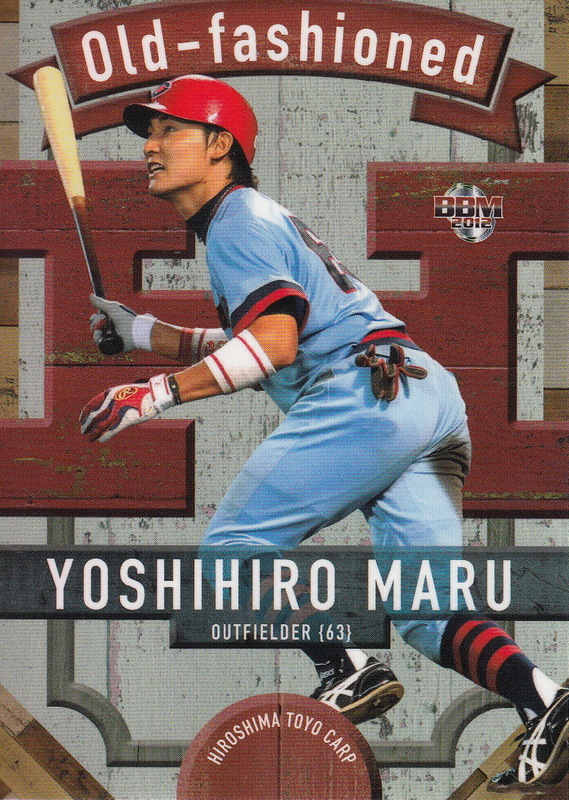 As with the other two sets it appears that the sport most represented in the set is baseball - the website lists about 30 baseball players (17 OB and 13 current) including Katsuya Nomura and Masanori Murakami. The other sports represented include wrestling, golf, figure skating, tennis, rugby, American football, volleyball, softball and horse racing. The card design looks exactly like last year's set which makes me wonder if this set should be viewed as a continuation of that set. 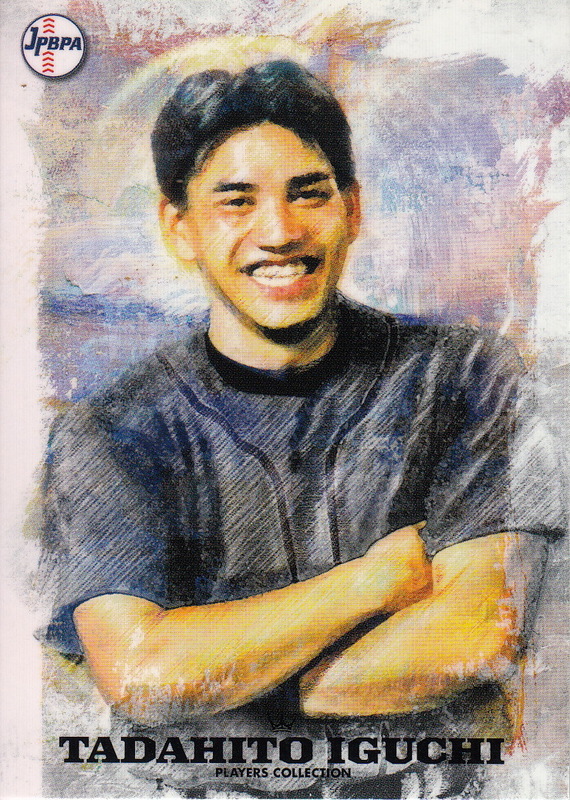 The website shows a couple cards called "Family Ties" - I don't know if these are a subset or an insert but one of them shows brother and sister baseball players Shingo and Yuki Kawabata. The set will be released in early November. 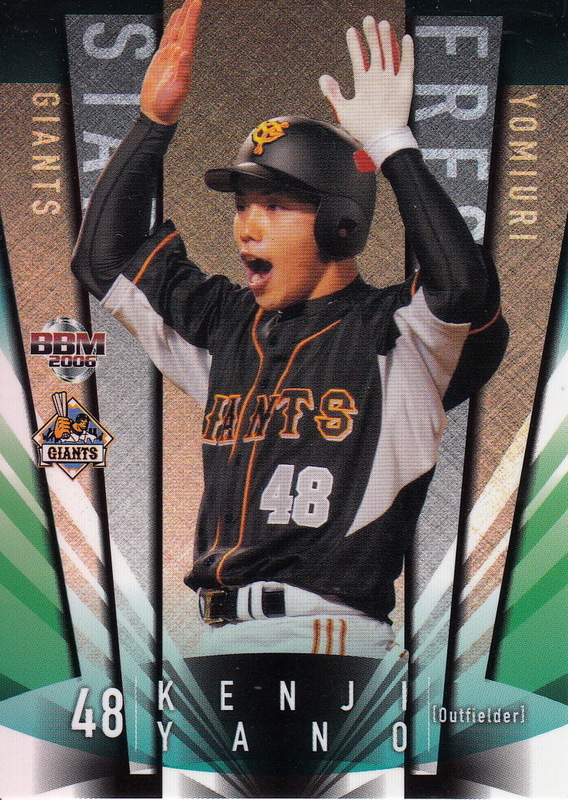 - Speaking of Yuki Kawabata, her league is getting a card set this year. 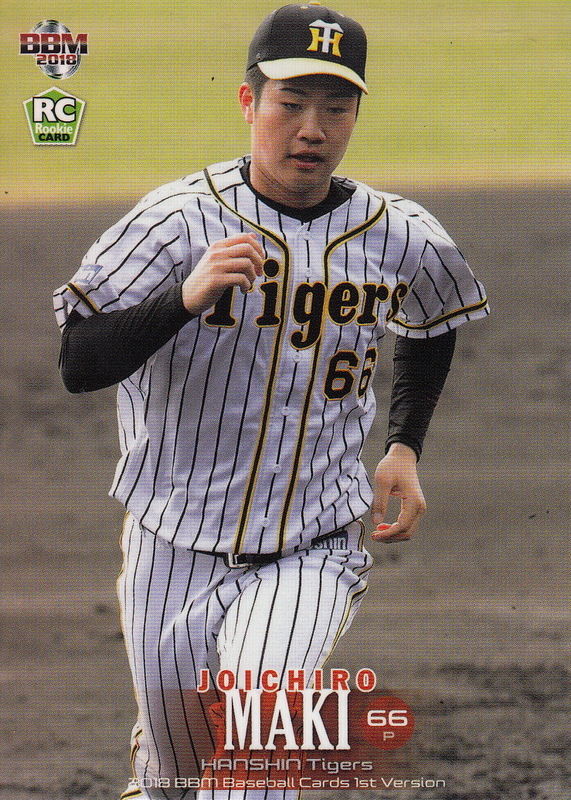 Epoch is releasing a second set for the Japan Women's Baseball League (JWBL) on October 20th (their first came out back in 2016). This is a pack based set that has an 80 card base set which includes the manager, coach and mascot for all four teams in the league. 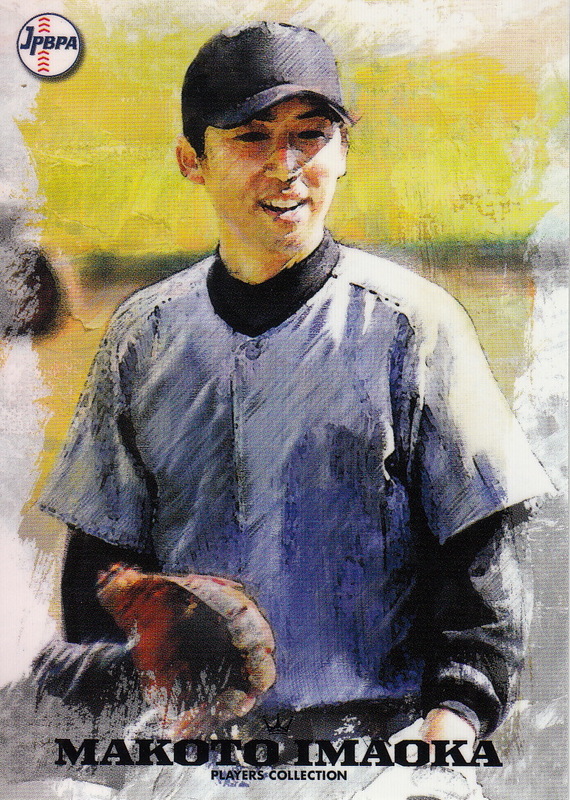 The base set will also include a card for Ami Inamura, the "First Pitch Queen". There will be autograph and memorabilia cards randomly inserted in the packs. - Epoch is releasing a fourth in its series of ultra high end team sets called "Stars & Legends" - this one will be for the Carp. A box of this retails for 13,300 yen and I think only includes four cards - although two of those will be "special insert cards" which are either autograph or memorabilia cards. The base set has 55 cards which I think are split between 33 active players and 22 OB players. The set will be out on October 27th. - I had suggested earlier this year that BBM might possibly do a 40th Anniversary set for the Lions moving to Saitama from Fukuoka (which happened in 1979 making this year the Lions' 40th season there). It doesn't look like BBM is doing a set but Epoch is - as another ultra high end set. Each box will retail for 12,100 yen and contain six cards - two of which will be autographed. 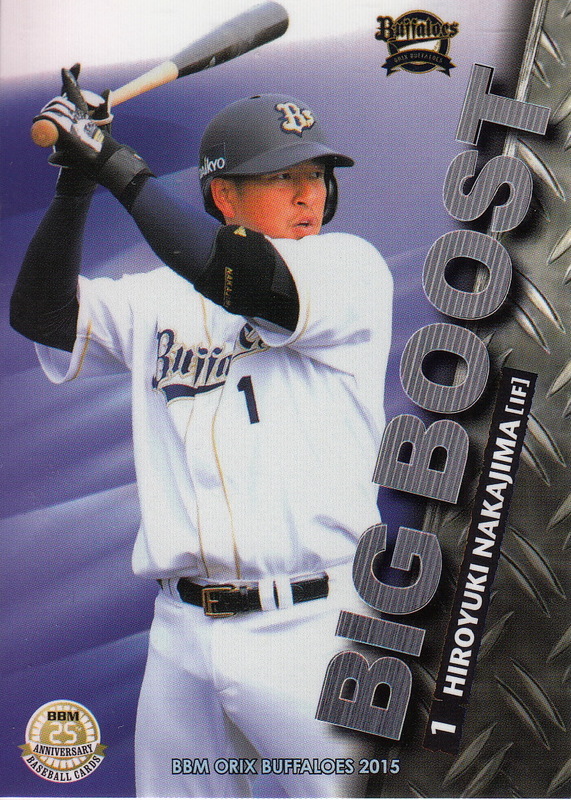 The base set contains 37 cards - 36 cards for OB Lions greats like Koji Akiyama, Tsutomu Itoh and Katsuya Nomura (this is apparently Nomura's first Epoch card) plus a card for...Ami Inamura for some bizarre reason. The set will be released on October 20th. - For the third year in a row Epoch is releasing a Pacific League only ultra high end set called "Pacific League Premier". Boxes of this will retail for 13,900 yen and contain eight cards - four base set cards, two "insert" cards (holospectra or "silk embossed") and two "Special Insert" cards (autograph or memorabilia). The base set has 54 cards - nine for each PL team. This set hits the shelves on October 20th. - I'm late in mentioning this but there's a new KBO set from SCC out. This one does cover 2018. Dan has all the details on it here but I'll summarize by saying that it's a 253 card set although the last 13 cards are all autograph cards. The base set then is 240 cards which breaks down to 24 cards for each of the ten KBO teams. What's a bit confusing is that those 240 cards are split between 100 "Normal" cards, 45 "Rare" cards, 43 "Holo" cards, 43 "Facsimile Autograph" cards and 9 "Rookie" cards - I don't know if any of these subsets are short printed or not. 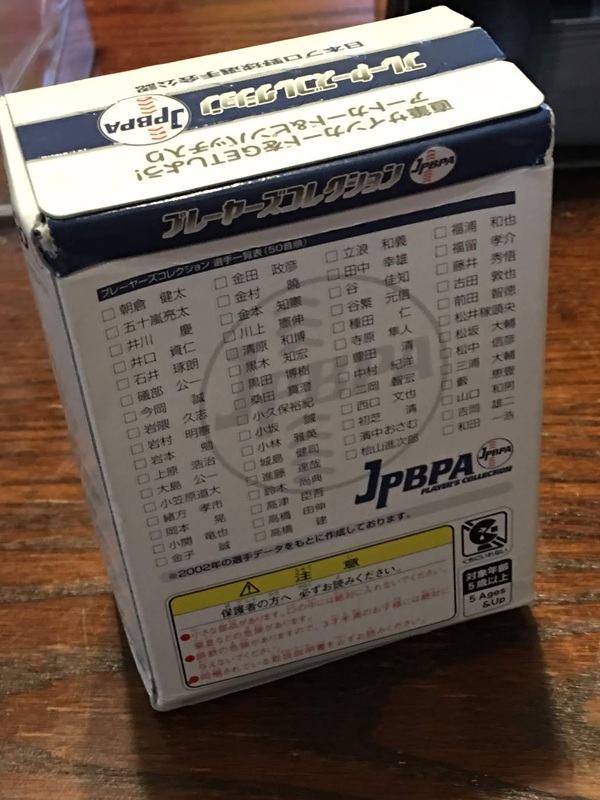 Dan's post includes information on where to purchase boxes for the set and he's also uploaded the checklist and card images for the set to TradingCardDB.com. I thought it'd be appropriate to show a picture of a player running today as I'm currently in Inverness, Scotland so that my wife can run the Loch Ness Marathon. Dan pointed out to me that the jersey was for Man-Soo Lee who had played for the Lions from 1982 (the KBO's first season) to 1997. 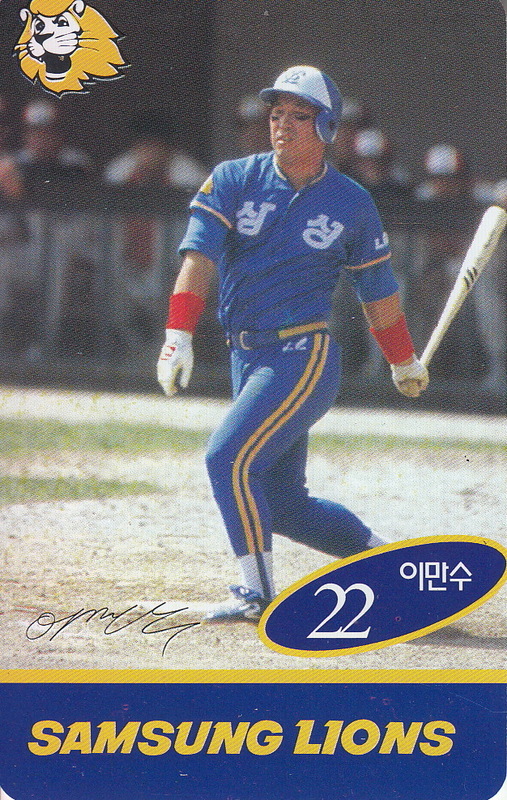 Lee was the KBO career home run leader when he retired although he has been passed by a number of players in the 20+ years since he retired. He coached in the US minor leagues for a couple years after he retired (Kinston in the Indians organization in 1998 and Charlotte in the White Sox organization in 1999) before becoming the White Sox bullpen coach from 2000 to 2006. He managed the KBO's SK Wyverns from 2011 to 2014. 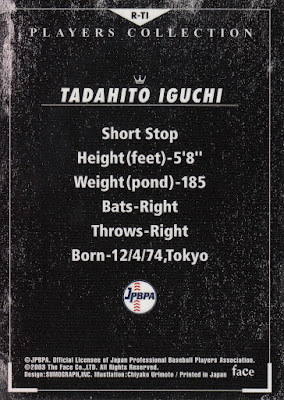 One of the things I am constantly on the lookout for is cards that show "collisions" (for lack of a better word) between NPB and MLB, especially from when NPB teams have come the US to do spring training. 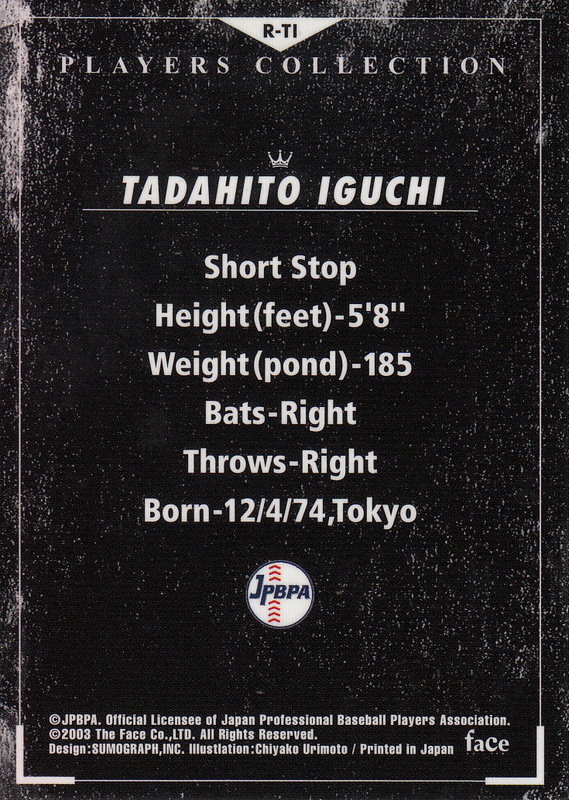 I recently picked up a card from the 1975 NST "Mr. Baseball" set (#189) that shows Yomiuri Giants manager Shigeo Nagashima with Gene Mauch who was manager of the Montreal Expos at the time. 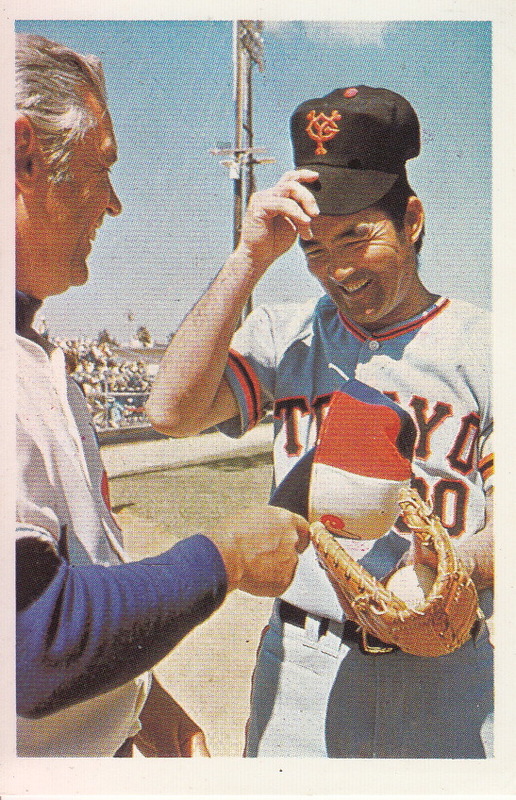 The Giants were doing spring training in Vero Beach, Florida that year and played at least one exhibition game against the Expos - there's a Calbee card from the 1974-75 set that shows Giants pitcher Kazumi Takahashi facing an unidentified right handed Expos batter. Posting is going to be very light for me for the next few weeks - I'm on a two and half week vacation. 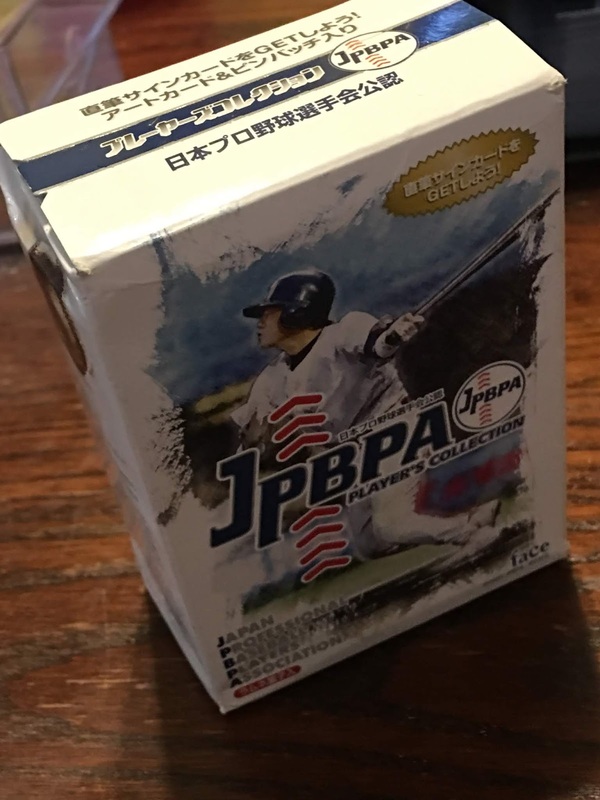 In honor of Labor Day here in the United States I thought I'd do a quick post on a set that was issued by the Japan Professional Baseball Players Association (JPBPA) back in 2003. The base set contained cards of 60 players. The image of the player was a drawing or painting and no team logos were shown. 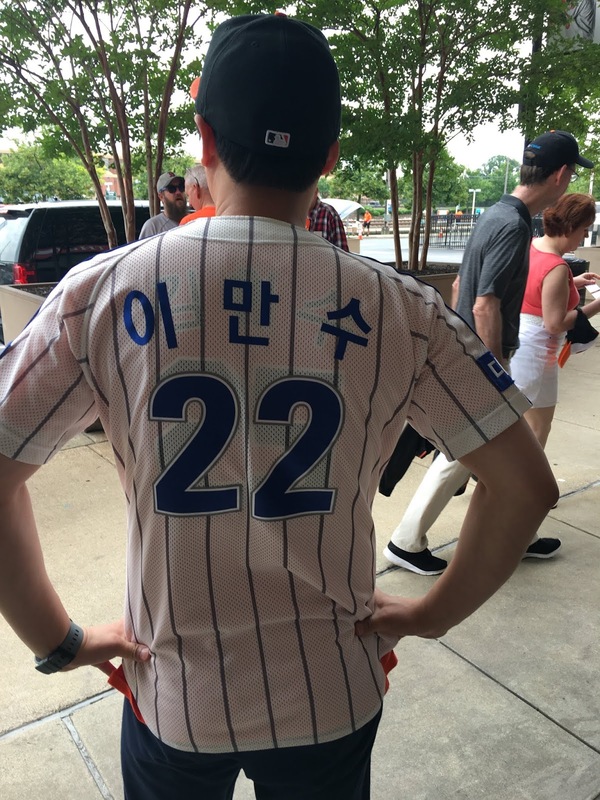 The player's team was also not identified. Most of the major NPB stars of the era were included in the set - Koji Uehara, Kazuhiro Kiyohara, Tadahito Iguchi, Hiroki Kuroda, Yoshinobu Takahashi, Hisashi Iwakuma, Tomoaki Kanemoto, Kazuo Matsui, Nobuhiko Matsunaka, Daisuke Matsuzaka and Takuro Ishii to name a few. Each of the 60 cards has a parallel version - the "special" version - and autographed versions of the "special" version were available. 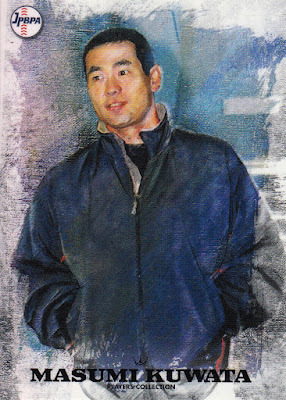 I had bought a pack of these from YakyuShop back when the set originally came out. Well, I say "pack" but it was actually sold in little boxes. Each box contained four cards - three base set cards plus one "special" card - along with a player pin. I think every box contained the same ratio of base cards to "special" card so the "special" cards are three times as rare as the base set cards. 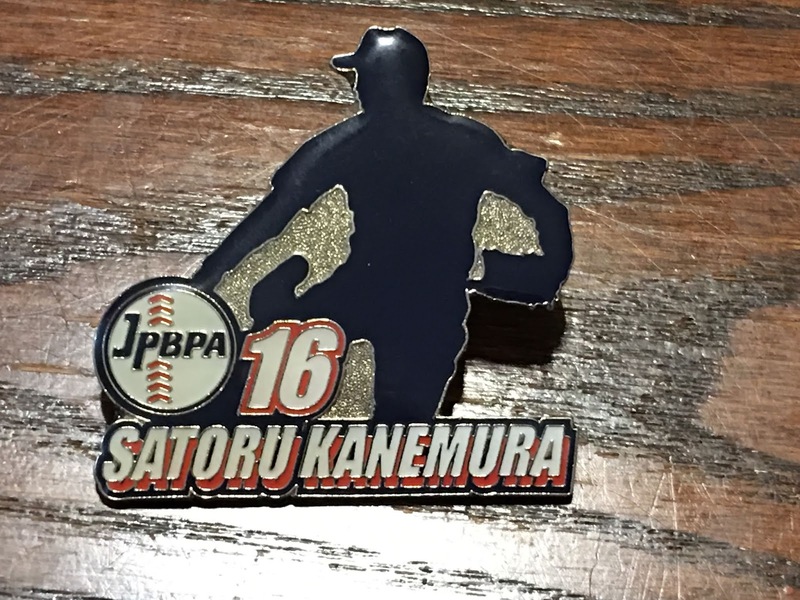 It was kind of an odd set and the JPBPA never issued another one. I'm not a big fan of sets that don't have the team logos (I never buy anything from Panini) so this was never a set i was real interested in completing. 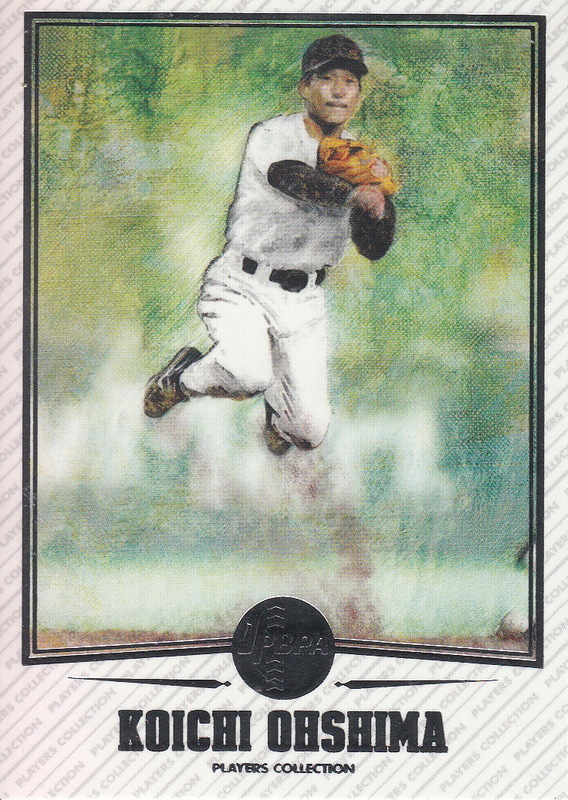 Ryan on the other hand has the complete base set and posted all the cards a few years back. 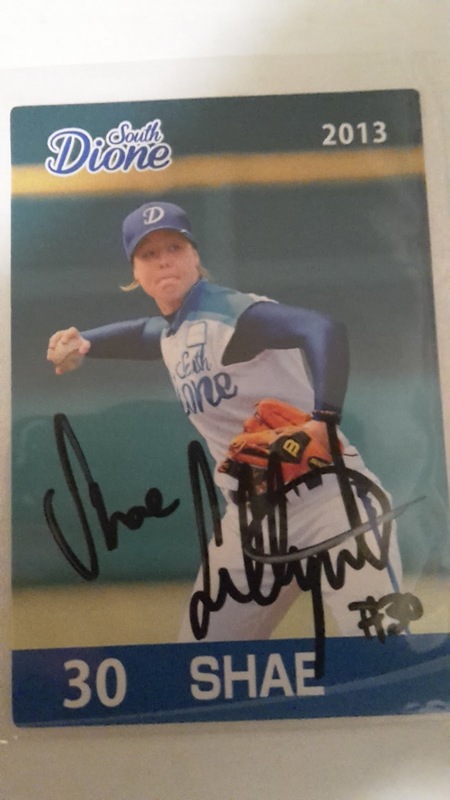 I got a message on Twitter from Steve Smith after my post the other day about the Samurai Japan team at the Women's Baseball World Cup. Steve wanted to point out that I had missed a player involved in the Cup who had a baseball card - Shae Lillywhite of the Australian team. 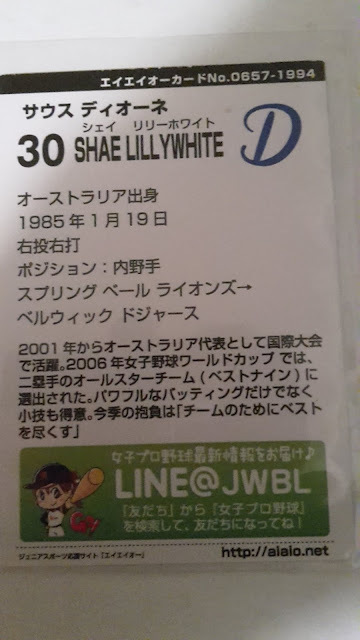 Steve is from the Melbourne, Australia area and belongs to the same baseball club as Lillywhite. She gave him the first card. The second card is one that she gave to a friend of Steve's. Steve's friend keeps it in her purse which accounts for the card's condition. I didn't really understand what Steve meant by "baseball club" so I asked him for an explanation. He said that since there's no high school or college baseball in Australia baseball is organized around local clubs. His particular club has "juniors (11-17), seniors, women, & masters (over 35 years). Melbourne has approx. 35 clubs that play against each other in different grades. The best local club players make up the ABL teams." There's a lot of continuity to these clubs -"Fathers can play with sons (or daughters) & you could play for the same club from juniors thru to masters. My coach has played for the club for approx 46 years, with his father, & his son (who also played for Brockton in the Can-Am League) & daughter (who happens to be the Australian Women's team manager) [which would be Simone Emma Wearne]." 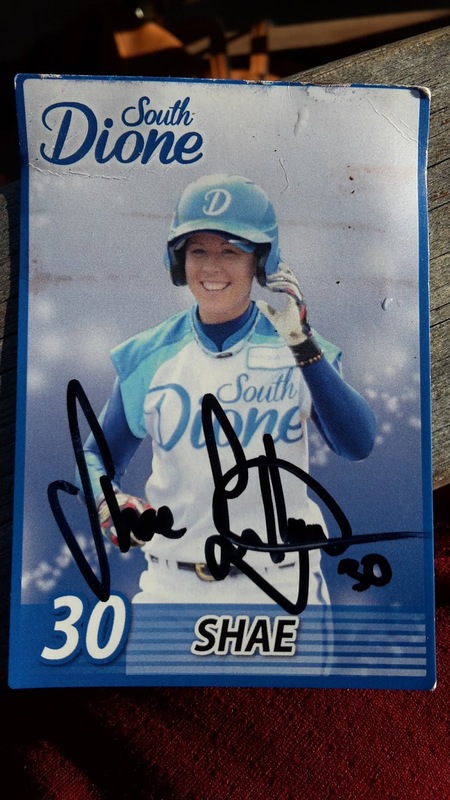 Thanks for sharing the photos of the cards, Steve and thanks for the information on club baseball in Australia! I was having a hard time picking a card of the week topic this week. I thought about doing Yoshihiro Maru of the Carp who has been haunting the Tokyo Yakult Swallows lately. 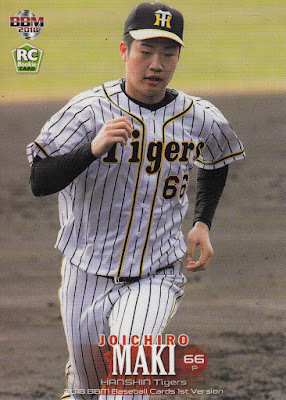 He hit a go ahead home run in the top of the tenth on Friday night which was the deciding run in the Carp's 6-5 victory in a game that the Swallows led 5-1 after seven innings. This came a week or so after he hit a game tying three run home run in the bottom of the ninth against Yakult in Hiroshima which set up Seiya Suzuki's sayanora home run immediately afterwards. 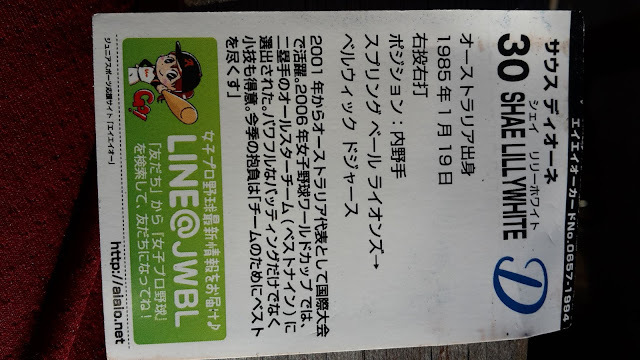 Again this led to a victory in a game in which the Swallows were up big late before losing - this time it was a 9-8 victory in a game in which the Swallows had led 7-0 after four innings and 8-5 going into the bottom of the ninth. But I also thought about highlighting Hiroyuki Nakajima of the Buffaloes whose three run home run in the bottom of the ninth yesterday beat his former team the Lions 10-8 in a game in which the Lions had led 8-3 after six innings. 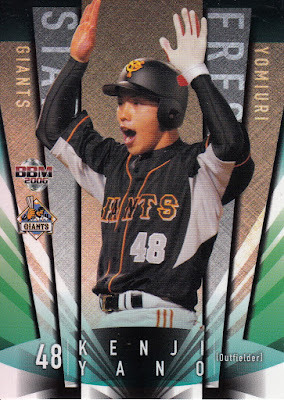 The advantage to picking Nakajima is that there's video readily available of the home run, the downside is that it would be the second straight week I did card of the week about a guy beating the Lions on a walk-off home run.